This is part of a post I did on my personal blog. I made it private a little while ago, and just haven't been doing that good updating it. Or this one, for that matter. I don't know how I feel having two blogs anymore. This is what it looked like before we got the pry bar out. I decided it was time to start a bit of demolition in my office to remove some built-in shelves. They don't look so bad, right? There are actually shelves just like these on the opposite wall, too, but I just wanted to remove these ones. I believe this room was originally set up to be used as a closet for some sort of master suite in the basement. There are no windows and crappy lighting, so I'm attempting to make this room more functional, and less cave-like. Let's check on the progress, shall we? 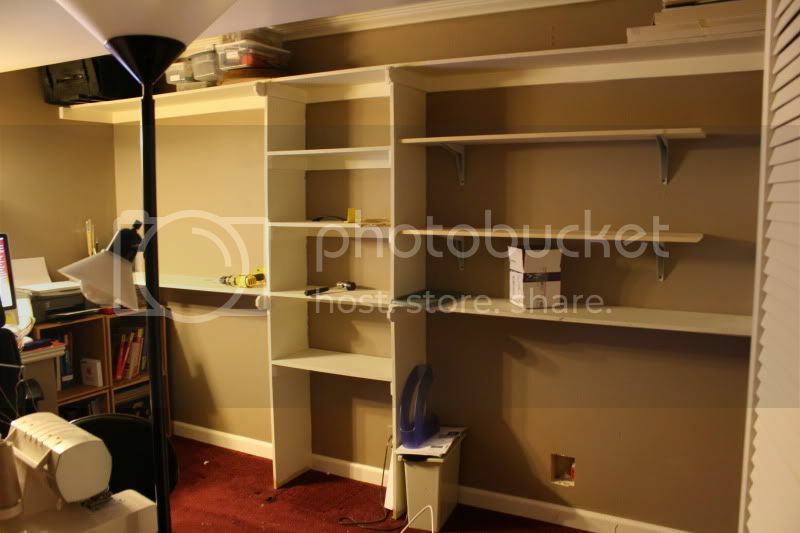 The two shelves on the gray brackets were installed by us, so they just came right down. The white shelves took a bit more effort. Look at "me" go! "I'm" such a hard worker. These were real stinks to remove. The shelves were screwed down to the cleats, but they'd covered all the screw heads so they were hard to find. 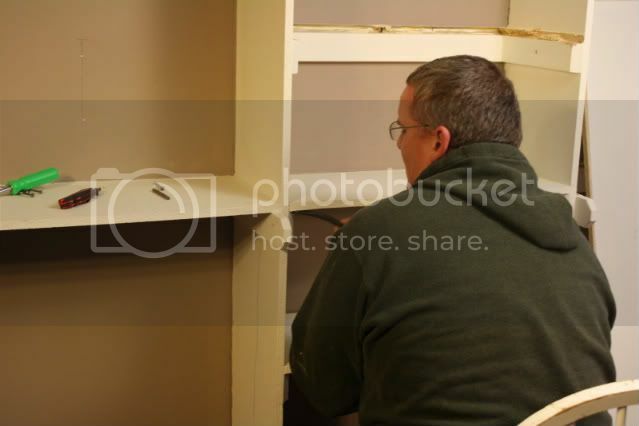 And they used silicone caulk to seal around the edges of the shelves. Grr. Did I mention they glued and used 3 inch screws to attach the cleats to the wall? Man, did "I" have a tough time with those! It all came off the walls eventually and there's quite a bit of damage to the wall (curse you, construction adhesive!) 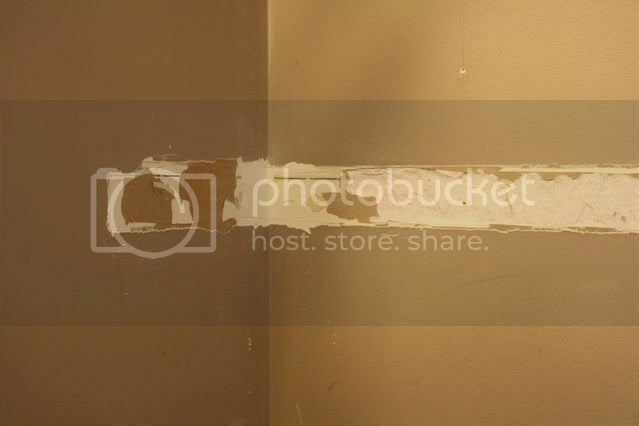 The white patches you see to the right are the insides of the drywall. Fun! The people who installed these were, well, they were on crack. That's the only explanation I can come up with. Half the annoyance was just trying to figure out what they did. 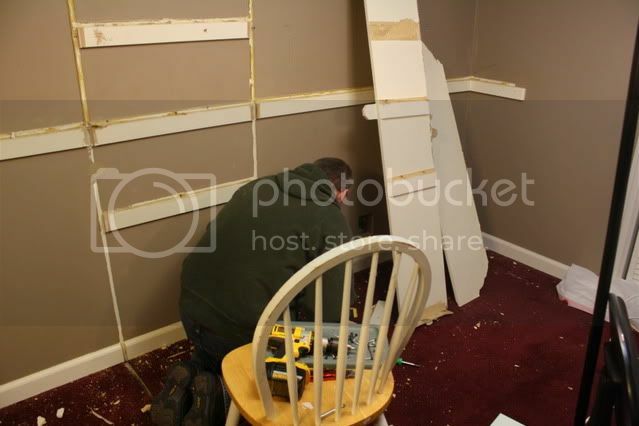 Now it really is my part — prepping the walls for either fixing the drywall damage, or covering it up with cupboards, depending on my sanity levels. Did I mention I'm also painting in here (including the ceiling)? Oh, and considering removing the carpet and putting in new flooring? On a budget of oh, nothing? Call me if you want to have a drywall party! I'll make treats! so-o when do we get to see the after pictures? ?